Scene setting: Gucci has moved its Milan HQ to a sprawling brick compound on the outskirts of town, whose size now befits the brand’s hegemony. With the impressive campus comes a giant built-in show space — a carnivalesque area just large enough for creative director Alessandro Michele to act like the daring ringmaster that he is. For the space’s debut show, a velvet curtain was dramatically drawn up to reveal a giant mirrored pyramid surrounded by a runway completely ensconced in glass pathways. The audience, sitting around the tube-like formation like mad fashion scientists, peered in on the clothes as if inspecting the delightfully strange creatures under a well-lit microscope. Mood board: Michele’s boundless creativity shows no signs of letting up. It comes on with the force of a freighter and with enough outfit options for a cast of ripefully eccentric characters, and then some. Identifying clear themes is a fruitless exercise, care of the boldly individualist nature of the collection. But suffice it to say that each look— on boys, on girls, on boys that looked like girls, and vice versa — was a fabulous feast of fashion fantasy. Best in show: The clothes were, of course, a knockout. 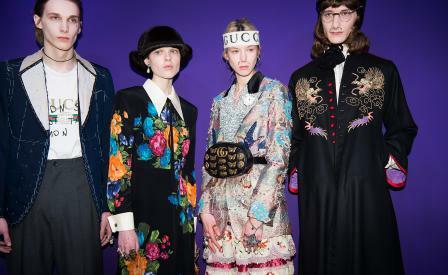 Fantastic sweeping embroidered men’s jacquard cloaks were good enough for a pontiff; and ’go-go’ velvet gowns with skirts shot with reams of glittering Lurex made one wonder just how much Gucci spends on its sample collection. But it was truly the accessories that shone in this show as never before. Though the Italian behemoth may do big business in its bamboo bags and horsebit loafers, shown of course in endless variations, it was the ancient accoutrements like fantastical bamboo canes, trapping gear and even Chinese umbrellas that bounced somewhere between truth and fiction and held its audience in true rapture.